This image taken by NASA's Dawn spacecraft shows Duginavi Crater, a large (96 miles, 155 kilometers in diameter) crater on Ceres. 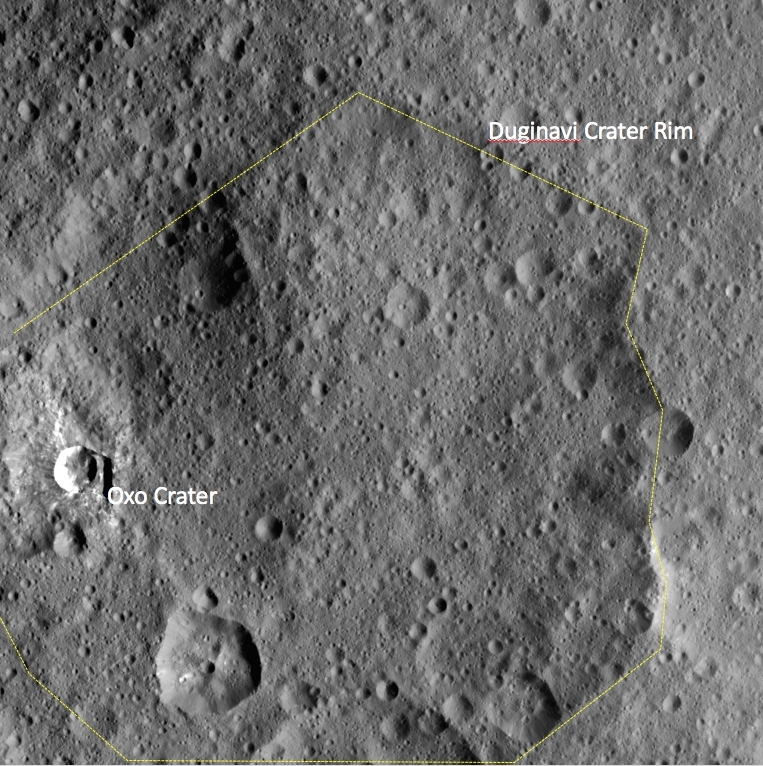 Duginavi's degraded rim barely stands out in this picture, which indicates this feature is very old. There are several factors that alter and eventually erase the shapes of geological features on bodies that do not have an atmosphere. These include gravity, which is responsible for landslides and scarps. The formation of newer craters, and the material that gets ejected in the process, has smoothed over craters such as Duginavi. Duginavi hosts the small Oxo Crater, recognizable by its bright rim and ejecta. 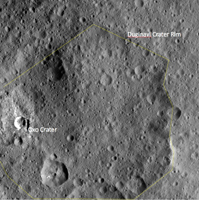 Oxo is the first site at which ice was discovered on Ceres. Duginavi is named for an agriculture god of the Kogi people of northern Colombia. Oxo bears the name of the god of agriculture in Afro-Brazilian beliefs of Yoruba derivation. These features can be found on the global map of Ceres. Dawn took this image on October 8, 2015, from its high-altitude mapping orbit, at a distance of about 915 miles (1,470 kilometers) above the surface. It has a resolution of 450 feet (140 meters) per pixel. The center coordinates of this image are 39 degrees north latitude, 8 degrees east longitude.